Moms make it all happen: one Mother's Day per year simply isn't enough to celebrate all their hard work! That's why it's so important to ensure that all moms are empowered and supported to reach their personal breastfeeding goals. The United States Breastfeeding Committee is a nonprofit coalition of nationally influential professional, educational, and governmental organizations working together to "advance breastfeeding on our Nation's agenda through Collaboration, Leadership, and Advocacy." 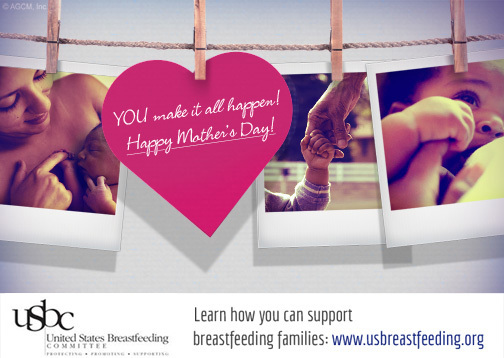 Join our work to make a difference for our Nation's families: www.usbreastfeeding.org/signup. In the words of Surgeon General Regina M. Benjamin, "Everyone can help make breastfeeding easier."